1.0.1 Where is my old text WhatsApp status? 1.1.1 How can I set a photo or video as My WhatsApp status? 1.2.0.1 How do I edit privacy settings of WhatsApp Status? Coming January WhatsaApp will be celebrating its eight Birthday. What other great features, Whatsapp has a cool feature which users are heavily using these day like photos and short videos status update called New Whatsapp Status updates. This is similar status update which people are using in Snapchat and Instragram. 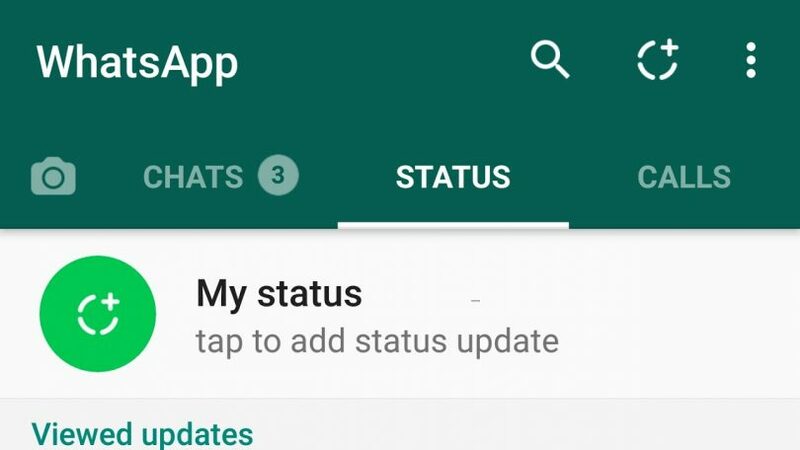 WhatsApp has added a new tab called status. Its the middle tab in Android and left bottom corner tab in iPhone. When you click on that, you will find a button of My Status. When you click on it, it will open a camera and your photo gallery. You can go for a live new photo or you can select any photo or short video from your gallery and post them as your Status update. Indeed its an exciting change, and it’s really easy and straight forward too. Still if you are not sure how to use this amazing feature, Follow this guide. Where is my old text WhatsApp status? As we said, this is really a new exciting feature, but in case if you are looking for your old text based whatsapp status. That still exist. The one line status in intact and you can use it too. But as per the trend people have forgotten that old status update and using this amazing feature. Some people still prefer to use the old text Whatsapp status as they don’t have enough material to use. At cool whatsapp status we have so much material which we are sure is enough for you to entertain people for a long time. The way Facebook community is using the new feature, we feel that old text status will be removed in the next update. There are Rumors that it will make a named under WhatsApp ‘taglines’ but no one is sure until the new WhatsApp update. How can I set a photo or video as My WhatsApp status? Tap on Status on the left bottom corner if you are on iPhone or middle status button if you are on Android. Tap on “My Status”. If you’ve set a status, tap on the little circle with a plus (+) sign. Take a snapshot by pressing the shutter button, or hold the button for few second to have a video status update. If you want to use any old picture or pre-capture video, select one from the camera roll from the bottom of the screen. Add a text caption by clicking on “Add a caption”, and then tap on the Send icon at the bottom right. Now you can tap on it to view, or press the menu button to check how many people have seen the update. You can also Tap on the eye icon to see the names of the people who viewed your “Live WhatsApp status Updates“. The WhatsApp status will disappear and will stay for 24 hours. Tap the camera icon on the top left. Take a photo or video, or select one from the camera roll. Add a caption if you want. Tap the green tick to finalize. Next you can either send it to a contact, or select My status to update your status. Tap the Send icon at the bottom right. You can now go to the Status tab to see your status, as above. If you messed up or by mistake added some photos or videos to your My Status in WhatsApp. Don’t worry here is how to delete my WhatsApp Status? Go to the Status tab. Scroll to find the status you want to delete. Tap on the eye icon that shows how many people have seen the status. This will show a list of the people who viewed your status. Tap the trash icon, and tap Delete to confirm. How do I edit privacy settings of WhatsApp Status? Once again, naturally, open your WhatsApp. Go to Status and tap on the Three dots menu icon on the top right, and tap on Status privacy. Alternatively, you can tap on the menu button in the main chats screen and open Settings > Account > Privacy > Status. There are three options here, My contacts, which is all your contacts; My contacts except.., which lets you pick contacts to exclude; and Only share with, which lets you pick contacts to share with. We have tried to make a simple and informative guide on the new feature of WhatsApp Messenger My Status updates. I am sure that’s all you wanted to know about New WhatsApp Status updates. We do have a very comprehensive guide on How to create WhatsApp Groups Joining Links, Which will surely very informative for Whatsapp Freaks. Kindly keep visiting our website and do subscribe to our newsletter for laest and frequest updates. Feel free ask any question or let us know what you thought via the comments below.